Let’s face it, about 6 months of the year Minnesota is cold, so why not train and prepare for a defense situation in the cold? A lot of people complain and don’t take this seriously and will only go to the range when the weather is nice. Firing a round may determine life or death. Get out to the range and train! Here are some tips to make your cold weather training successful. When you are selecting clothing, make sure that you dress in layers. You want to keep your clothing slim and tight, but not so tight that you will restrict your movement. 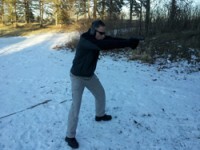 Choose clothing that is slim and tight enough so you can manipulate your gun efficiently with no restrictions. How about gloves? Gloves are an important piece of clothing when training in cold weather. The same applies with gloves, select gloves that will be warm, yet slim. The last thing you want are gloves that won’t allow you to manipulate your firearm. It is important to keep blood flowing when you are in the cold. Don’t stand around, keep moving, and keep the blood flowing to your extremities. If you have to, do some push-ups, burpees, or jumping jacks. If you find it necessary to do one of those activities to warm up, make sure that you don’t exert yourself too much. You don’t want to start sweating. Sweat mixed with cold weather is bad and can cause discomfort and even hypothermia. You need to fuel your body properly in order to be comfortable and function. It is important to eat something solid, a well-balanced meal with carbohydrates, fats and protein before you go out to the range. This will help you sustain out in the cold. About mid-morning, make sure you eat a snack that will keep you going until it is lunch time. Lastly, stay hydrated. Although it is cold out, don’t fill your belly with warm coffee, that doesn’t count! Make sure you are drinking plenty of water, especially if you are moving a lot. We stress mindset, because mindset is extremely important in shooting. Stay positive and have fun! If you go to train in the cold and think “It’s cold out, this is going to be miserable,” well then you just set the bar for a miserable time at the range. Prepare yourself for a cold day at the range mentally. Know that it may be cold, but you will have the proper cold weather gear and mindset to stay positive and have a productive training session.